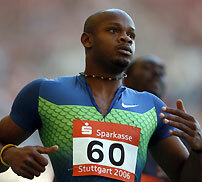 GATESHEAD, England, June 11 - Jamaican Asafa Powell equalled the men's 100 metres world record with a time of 9.77 seconds at a grand prix meeting on June 11. Powell set the world best in Athens in June 2005 which was matched by American Olympic and world champion Justin Gatlin in Doha on May 12 this year. "I came out here to show them I'm back to where I started last year and I'm going to pick up this season from now on," Powell told BBC television. He added: "As I said, I can run as fast as I want when I want. I told them I would do my best here and I didn't let them down. "My coach is not all that happy because in the end I didn't do what he told me to do but I am going to work on that and come back." Powell and co-record holder Gatlin are due to race against each other in London on July 28. The pair's last clash on the track was in London in July 2005 when Powell pulled up with a groin problem that ended his season. After easing through his heat on Sunday, Powell got a great start in the final and was never troubled, finishing well clear of compatriot Michael Frater in 10.06. Britain's Dwain Chambers, making his comeback after a two-year ban for doping, was third in 10.07. The European champion's ban for a positive test for the designer steroid THG (tetrahydrogestinone) ended last November but he was only cleared to compete on Friday by the International Association of Athletics Federations (IAAF) after repaying prize and appearance money.